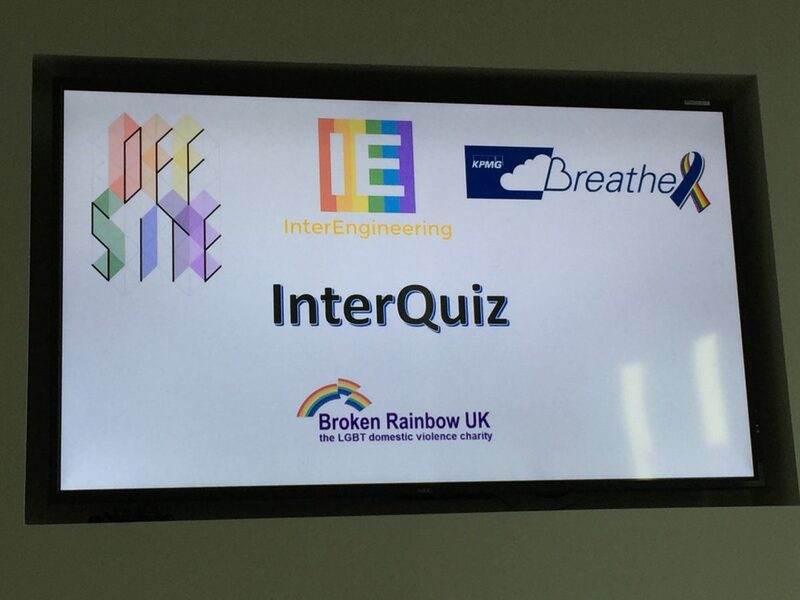 On Thursday 12th May 2016, we teamed up with OffSite to put on InterQuiz 2016. KPMG kindly hosted the event at their Canary Wharf offices, and so we planned an event to raise funds for an LGBT charity. After much deliberation, we opted to support Broken Rainbow, a charity which supported LGBT domestic violence victims. All monies raised from ticket sales, raffle ticket sales and auction opportunities on the night went to Broken Rainbow, amounting to nearly £1400. Note: Unfortunately, since the event, Broken Rainbow has gone into administration with questions around their operations. We are extremely disappointed with this and have raised a formal complaint with the Charities Commission. Aside from the unfortunate instance of BR, this event illustrates the strength in the LGBT community coming together to raise much needed funds for services which are needed for our community and face increasing under-funding. We look forward to further future collaborations with the various Inter-networks to raise funds for other charities. If you would like to co-host an event with us and work together on supporting charitable causes then please email us.